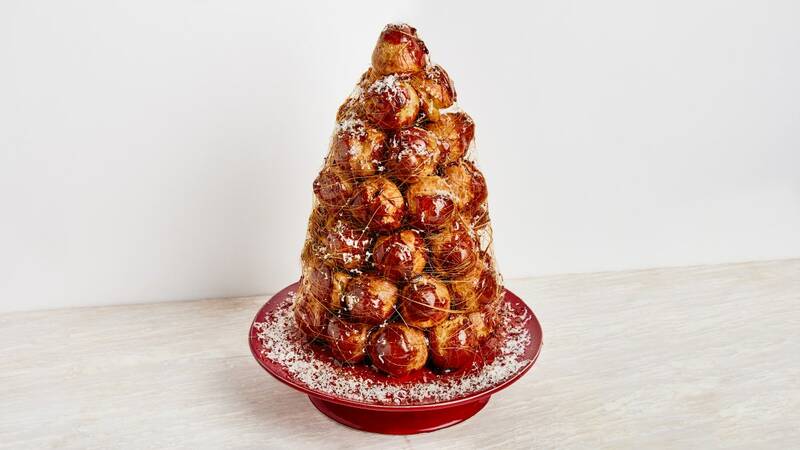 Let’s start from the beginning: Croquembouche is a tower of cream puffs, classically filled with a sweet pastry cream, each one dipped in caramel, with thin caramel strands enrobing the edible monument. Fancy, classy, dessert-y. We love the drama but wanted to take it to the savory side, so our version is constructed with cheesy gougères and an herbed cheese filling, and the caramel is spiked black pepper. It’s the showstopping holiday appetizer you didn’t know you needed.